No one would deny the centrality of knowing God to biblical theology. Yet few treatments of the doctrines of God and salvation acknowledge that, as with every relationship, the knowledge of God has two sides: believers know God and are also known by him. Whereas knowing God is the focus of countless academic and popular books and articles, being known by God has been barely noticed. 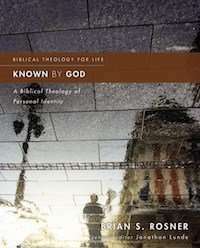 Rosner’s book makes a considerable contribution at correcting this imbalance in the published literature and readers will readily find it helpful both academically as well as pastorally. I’ll likely write a full-on review, but meanwhile, I encourage you to download this PDF for a helpful, albeit more academic, musing.